A rare Crystal Linga was found among a collection of ancient artifacts discovered in Candi Sukuh, Central Java. Candi Sukuh is a Hindu-Javanese temple which bears an uncanny resemblance to the South-American pyramids of the Maya and Aztec. Archaeologist Septina Wardhani measures the Crystal Linga artifact. 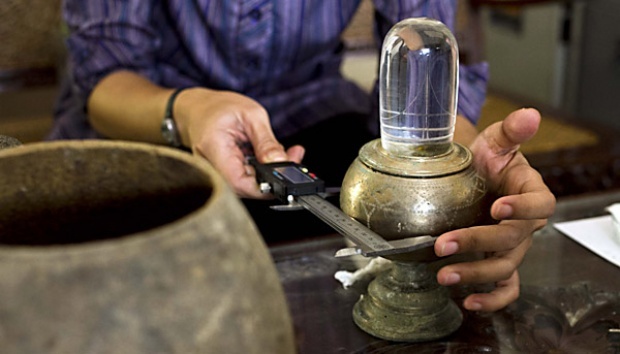 During the restoration of Candi Sukuh in Java Indonesia, various archaeological objects have been retrieved. Most of the items are believed to be relics from the 15th century, the time of the Pyramid-like temple’s construction. Among the artifacts were two pieces of pottery. One of the ancient stoneware pots was filled with an assortment of beads, trinkets and ancient jewelry. 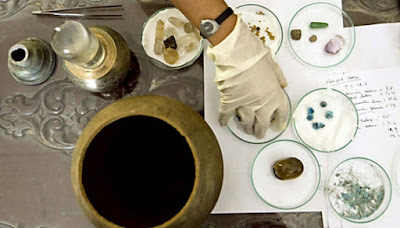 The artifacts discovered during the restoration of Candi Sukuh included two stone jars, jewelry, and the crystal Linga. A crystal Linga, encased in bronze, was found in the other pot from Candi Sukuh. The linga shaped artifact is made of glass and stands on an intricately engraved bronze base which contains water. “It’s fascinating that the water stored in the bronze was not dry, although it has been stored for many centuries," said Deny. 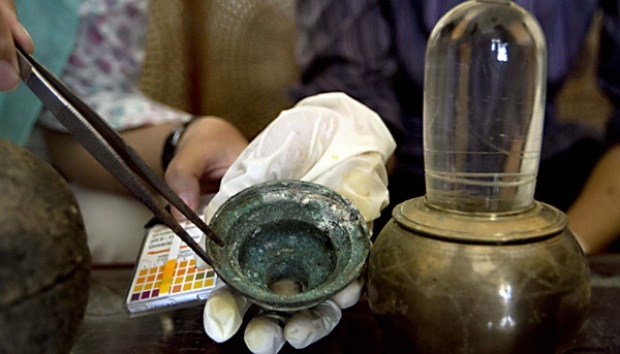 Archaeologists test the acidity of the water in the Crystal Linga. Local residents believe that the discovery of the water is linked to the mythological Tirta Amrita, or Water of Life. The Legend of the Quest for the Water of Life is told in the Adiparwa, the first book of the Hindu epic, the Mahabharata. Part of the Tirta Amrita story can be found inscribed at Candi Sukuh. The stone jars were discovered hidden beneath the Pangruwatan Monument at Candi Sukuh. The ancient jars and their contents are currently being stored in the Archaeological Heritage Preservation Hall of Central Java, Prambanan, Klaten. Candi Sukuh is one of three unique temples found along the slopes of Mount Lawu, two of which are Pyramid-shaped. Pictures and information in this article are sourced from Tempo News. The water of life is symbolized by the zero in the real time, the year 10,000,000,002,016. Drink these zeros with your mind and eternity rises from within you. Nothing could be simpler, nothing will change you more. Hinduism is going to come back to rule the world.Now everyone will know the connection with the maya civilisation,and all the pyramids of the world.